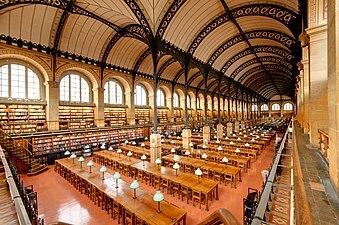 Beaux-Arts architecture (/ˌboʊˈzɑːr/; French: [bozaʁ]) was the academic architectural style taught at the École des Beaux-Arts in Paris, particularly from the 1830s to the end of the 19th century. It drew upon the principles of French neoclassicism, but also incorporated Gothic and Renaissance elements, and used modern materials, such as iron and glass. It was an important style in France until the end of the 19th century. It also had a strong influence on architecture in the United States, because of the many prominent American architects who studied at the Beaux-Arts, including Henry Hobson Richardson, John Galen Howard, Daniel Burnham, and Louis Sullivan. The "Beaux Arts" style evolved from the French classicism of the Style Louis XIV , and then French neoclassicism beginning with Louis XV and Louis XVI. 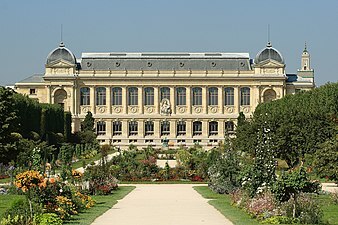 French architectural styles before the French Revolution were governed by Académie royale d'architecture (1671–1793), then, following the French Revolution, by the Architecture section of the Académie des Beaux-Arts. The Academy held the competition for the "Grand Prix de Rome" in architecture, which offered prize winners a chance to study the classical architecture of antiquity in Rome. The formal neoclassicism of the old regime was challenged by four teachers at the Academy, Joseph-Louis Duc, Félix Duban, Henri Labrouste and Léon Vaudoyer, who had studied at the French Academy in Rome at the end of the 1820s, They wanted to break away from the strict formality of the old style by introducing new models of architecture from the Middle Ages and the Renaissance. Their goal was to create an authentic French style based on French models. Their work was aided beginning in 1837 by the creation of the Commission of Historic Monuments, headed by the writer and historian Prosper Mérimée, and by the great interest in the Middle Ages caused by the publication in 1831 of The Hunchback of Notre-Dame by Victor Hugo. Their declared intention was to "imprint upon our architecture a truly national character." The style referred to as Beaux-Arts in English reached the apex of its development during the Second Empire (1852–1870) and the Third Republic that followed. The style of instruction that produced Beaux-Arts architecture continued without major interruption until 1968. The Beaux-Arts style heavily influenced the architecture of the United States in the period from 1880 to 1920. In contrast, many European architects of the period 1860–1914 outside France gravitated away from Beaux-Arts and towards their own national academic centers. Owing to the cultural politics of the late 19th century, British architects of Imperial classicism followed a somewhat more independent course, a development culminating in Sir Edwin Lutyens's New Delhi government buildings. The Beaux-Arts training emphasized the mainstream examples of Imperial Roman architecture between Augustus and the Severan emperors, Italian Renaissance, and French and Italian Baroque models especially, but the training could then be applied to a broader range of models: Quattrocento Florentine palace fronts or French late Gothic. American architects of the Beaux-Arts generation often returned to Greek models, which had a strong local history in the American Greek Revival of the early 19th century. For the first time, repertories of photographs supplemented meticulous scale drawings and on-site renderings of details. Beaux-Arts training made great use of agrafes, clasps that link one architectural detail to another; to interpenetration of forms, a Baroque habit; to "speaking architecture" (architecture parlante) in which supposed appropriateness of symbolism could be taken to literal-minded extremes. Beaux-Arts training emphasized the production of quick conceptual sketches, highly finished perspective presentation drawings, close attention to the program, and knowledgeable detailing. Site considerations tended toward social and urbane contexts. All architects-in-training passed through the obligatory stages—studying antique models, constructing analos, analyses reproducing Greek or Roman models, "pocket" studies and other conventional steps—in the long competition for the few desirable places at the Académie de France à Rome (housed in the Villa Medici) with traditional requirements of sending at intervals the presentation drawings called envois de Rome. Beaux-Arts building decoration presenting images of the Roman goddesses Pomona and Diana. Note the naturalism of the postures and the channeled rustication of the stonework. Beaux-Arts architecture depended on sculptural decoration along conservative modern lines, employing French and Italian Baroque and Rococo formulas combined with an impressionistic finish and realism. In the façade shown above, Diana grasps the cornice she sits on in a natural action typical of Beaux-Arts integration of sculpture with architecture. Slightly overscaled details, bold sculptural supporting consoles, rich deep cornices, swags and sculptural enrichments in the most bravura finish the client could afford gave employment to several generations of architectural modellers and carvers of Italian and Central European backgrounds. A sense of appropriate idiom at the craftsman level supported the design teams of the first truly modern architectural offices. Classical details: references to a synthesis of historicist styles and a tendency to eclecticism; fluently in a number of "manners"
The first American architect to attend the École des Beaux-Arts was Richard Morris Hunt, between 1846 and 1855, followed by Henry Hobson Richardson in 1860. They were followed by an entire generation. Henry Hobson Richardson absorbed Beaux-Arts lessons in massing and spatial planning, then applied them to Romanesque architectural models that were not characteristic of the Beaux-Arts repertory. His Beaux-Arts training taught him to transcend slavish copying and recreate in the essential fully digested and idiomatic manner of his models. Richardson evolved a highly personal style (Richardsonian Romanesque) freed of historicism that was influential in early Modernism. The "White City" of the World's Columbian Exposition of 1893 in Chicago was a triumph of the movement and a major impetus for the short-lived City Beautiful movement in the United States. Beaux-Arts city planning, with its Baroque insistence on vistas punctuated by symmetry, eye-catching monuments, axial avenues, uniform cornice heights, a harmonious "ensemble," and a somewhat theatrical nobility and accessible charm, embraced ideals that the ensuing Modernist movement decried or just dismissed. The first American university to institute a Beaux-Arts curriculum is the Massachusetts Institute of Technology (MIT) in 1893, when the French architect Constant-Désiré Despradelle was brought to MIT to teach. The Beaux-Arts curriculum was subsequently begun at Columbia University, the University of Pennsylvania, and elsewhere. From 1916, the Beaux-Arts Institute of Design in New York City schooled architects, painters, and sculptors to work as active collaborators. Numerous American university campuses were designed in the Beaux-Arts, notably: Columbia University, (commissioned in 1896), designed by McKim, Mead & White; the University of California, Berkeley (commissioned in 1898), designed by John Galen Howard; the United States Naval Academy (built 1901–1908), designed by Ernest Flagg; the campus of MIT (commissioned in 1913), designed by William W. Bosworth, Carnegie Mellon University (commissioned in 1904), designed by Henry Hornbostel; and the University of Texas (commissioned in 1931), designed by Paul Philippe Cret. While the style of Beaux-Art buildings was adapted from historical models, the construction used the most modern available technology. 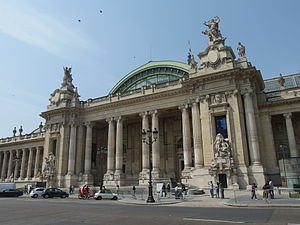 The Grand Palais in Paris (1897–1900) had a modern iron frame inside; the classical columns were purely for decoration. The 1914–1916 construction of the Carolands Chateau south of San Francisco was built to withstand earthquakes, following the devastating 1906 San Francisco earthquake). The noted Spanish structural engineer Rafael Guastavino (1842–1908), famous for his vaultings, known as Guastavino tile work, designed vaults in dozens of Beaux-Arts buildings in the Boston, New York, and elsewhere. Beaux-Arts architecture also brought a civic face to the railroad. (Chicago's Union Station, Detroit's Michigan Central Station, Jacksonville's Union Terminal and Washington, DC's Union Station are famous American examples of this style.) Cincinnati has a number of notable Beaux-Arts style buildings, including the Hamilton County Memorial Building in the Over-the-Rhine neighborhood, and the former East End Carnegie library in the Columbia-Tusculum neighborhood. An ecclesiastical variant on the Beaux-Arts style is Minneapolis' Basilica of St. Mary, the first basilica in the United States, which was designed by Franco-American architect Emmanuel Louis Masqueray (1861–1917) and opened in 1914. 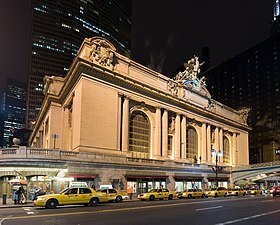 Two of the best American examples of the Beaux-Arts tradition stand within a few blocks of each other: Grand Central Terminal and the New York Public Library. Another prominent U.S. example of the style is the largest academic dormitory in the world, Bancroft Hall at the abovementioned United States Naval Academy. James Edwin Ruthven Carpenter Jr. The prominent architectural firm of McKim, Mead & White designed many well-known Beaux-Arts buildings. Beaux-Arts was very prominent in public buildings in Canada in the early 20th century. Notably all three prairie provinces' legislative buildings are in this style. From 1880 the so-called Generation of '80 came to power, who were admirers of France as a model republic and for cultural and esthetic tastes. Buenos Aires is a center of Beaux-Arts architecture which continued to be built as late as the 1950s. Several Australian cities have some significant examples of the style. It was typically applied to large, solid-looking public office buildings and banks, particularly during the 1920s. ^ a b Texier 2012, p. 76. ^ a b Robin Middleton, ed. (1982). The Beaux-Arts and Nineteenth-century French Architecture. London: Thames and Hudson. ^ a b c d e f g h i Clues to American Architecture. Klein and Fogle. 1986. p. 38. ISBN 0-913515-18-3. ^ Arthur Drexler, ed. (1977). The Architecture of the École des Beaux-Arts. New York: Museum of Modern Art. ^ James Philip Noffsinger. The Influence of the École des Beaux-arts on the Architects of the United States (Washington DC., Catholic University of America Press, 1955). ^ Howe, Jeffery. "Beaux-Arts Architecture in America". www.bc.edu. Retrieved 1 August 2017. ^ Chafee, Richard. The Architecture of the École des Beaux-Arts. New York: Museum of Modern Art, 1977. ^ Jarzombek, Mark (2004). Designing MIT: Bosworth's New Tech. Northeastern University Press. ^ "Architecture | The Basilica of Saint Mary". www.mary.org. Retrieved 9 November 2017. ^ National Register of Historic Places Nomination Form [page 3]. National Park Service of the U.S. Department of the Interior, September 1977, as recorded to the Maryland State Archives, December 2, 1992. Accessed January 14, 2016. United States. Commission of Fine Arts. 1978, 1988 (2 vols.). Sixteenth Street Architecture (The Commission of Fine Arts: Washington, D.C.: The Commission) – profiles of Beaux-Arts architecture in Washington D.C. SuDoc FA 1.2: AR 2. Wikimedia Commons has media related to Beaux-Arts architecture.